Scentre Group approached Avatree to design and install a unique and captivating lighting installation in Westfield Sydney, their premium retail destination in the heart of Sydney’s CBD. in Australia. 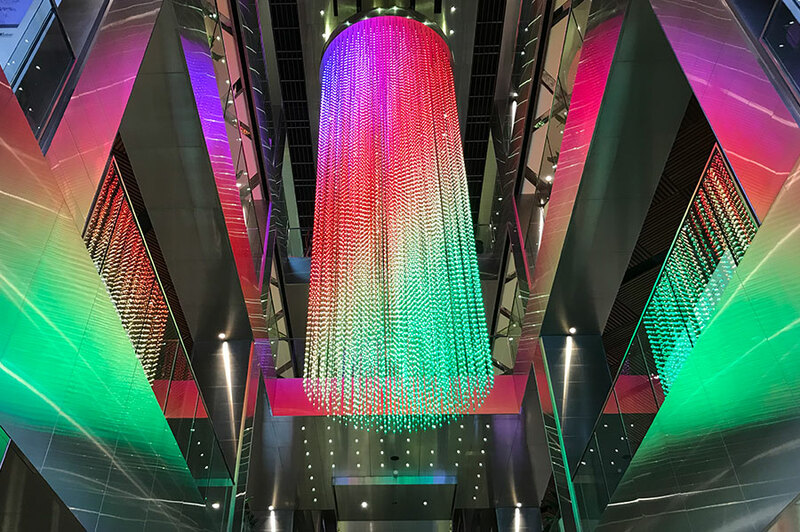 Taking centre stage in the entrance to Westfield Tower, off Pitt St Mall, the installation spans three floors and contains over 31,000 LED lights! Fully customisable, the permanent installation houses pixel programmable LEDs which are mounted in ash tinted tubes that spiral down to a stunning depth of 8 metres. This depth allows our programmers to create 3D animations that illuminate and pulsate within the installation. The customisable design of the 3D Matrix lighting installation ensures its modality to celebrate key events and festivals throughout the year in spectacular fashion.